1a. Terrestrial runoff in spring is the primary source of new nutrients (predominantly organic) to lagoons, with direct inputs from coastal erosion and groundwater seepage becoming important secondary sources in late summer. 1b. Nutrient fluxes from land will increase in the future, and proportional contributions from coastal erosion and groundwater seepage will become greater. 2a. Water exchange between lagoons and open coastal waters is controlled by interactions between river discharge, sea ice, water level (e.g., waves and storm surge), and barrier island geomorphology over seasonal to multi-decadal timeframes. 2b. Seasonal, inter-annual, and inter-decadal variability in water exchange between lagoons and open coastal waters will increase with climate change in the Arctic. 3a. Arctic lagoons are net heterotrophic systems that serve as hot spots for decomposition of land-derived organic matter and release of CO2 and N2 to the atmosphere, with peak CO2 and N2 production rates in spring and early summer, and slower but cumulatively significant production in winter. 3b. Inorganic nutrients supporting primary production in the lagoons are chiefly supplied by decomposition of sediment organic matter, from which the proportional contribution of terrestrial versus locally produced material varies strongly among seasons and between years as a function of terrestrial input dynamics. 3c. As permafrost thaws, coastal erosion accelerates, and groundwater inputs to lagoons increase in the future, nutrient stocks and cycling rates will be enhanced, and the lagoons will become increasingly important sources of CO2 and N2 to the atmosphere. 4a. Extreme seasonal variations in salinity, temperature, and organic matter supply (external sources and local production) control microbial and metazoan community structure (composition and diversity) and trophic linkages (carbon sources, trophic positions) within the lagoons. 4b. Microbial and metazoan communities with higher taxonomic diversity have higher stability (reduced variability) and resiliency (inter-annual reestablishment of function), which is driven by complementary resource use, the presence of functional redundancies, and consumer foraging behaviors that closely track resource fluctuations. 4c. Long-term changes in the magnitude and variability of terrestrial inputs and water exchanges between lagoons and the open ocean will influence microbial and metazoan community structure and trophic linkages and will alter ecosystem resiliency by reducing diversity, infaunal and epifaunal biomass, and the proportion of benthic perennial species. 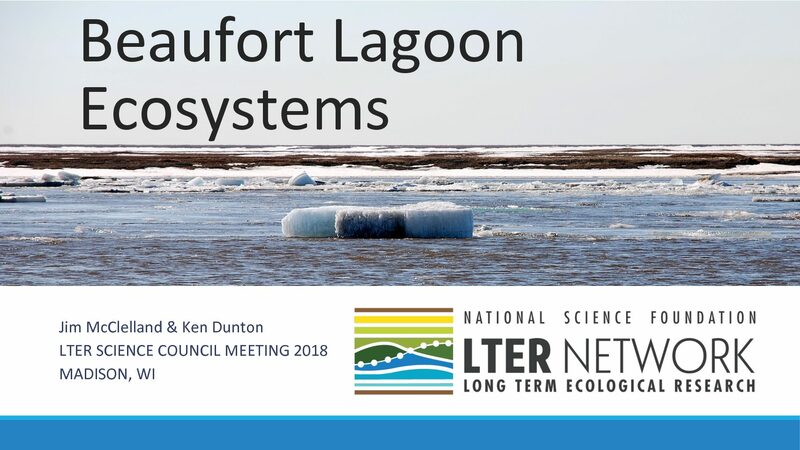 The Beaufort Lagoon Ecosystems LTER program is built around the concept that differential availability of temporally-distinct resources is critical for defining trophic linkages and maintaining stability and resilience of food webs. The Beaufort lagoon ecosystems experience extreme variability in seasonal cycles, which are now subject to rapid directional shifts driven by climate change. The BLE-LTER asks: How do variations in terrestrial inputs, local production, and exchange between lagoon and ocean waters over seasonal, inter-annual, inter-decadal, and longer timeframes interact to control food web structure through effects on carbon and nitrogen cycling, microbial and metazoan community composition, and trophic linkages? Arctic lagoons provide a unique opportunity to study these interactions in the absence of fringing wetlands that often modulate land-ocean interactions in other lagoon systems. In addition, barrier island geomorphology, which exerts a strong control on water exchange between lagoons and the open ocean, is highly dynamic in the Arctic because sea-ice effects are superimposed on the effects of currents, sea level and waves. Thus, connections between inputs from land and lagoon ecosystems are more direct, and water exchanges between lagoons and the open ocean are more variable than is typical of lower latitude systems. Specific study sites are located in Elson Lagoon (western Beaufort), Simpson Lagoon and Stefansson Sound (central Beaufort), and Kaktovik and Jago lagoons (eastern Beaufort). This LTER program is being operated in collaboration with local stakeholder groups and the US Fish and Wildlife Service, which manages the Arctic National Wildlife Refuge. 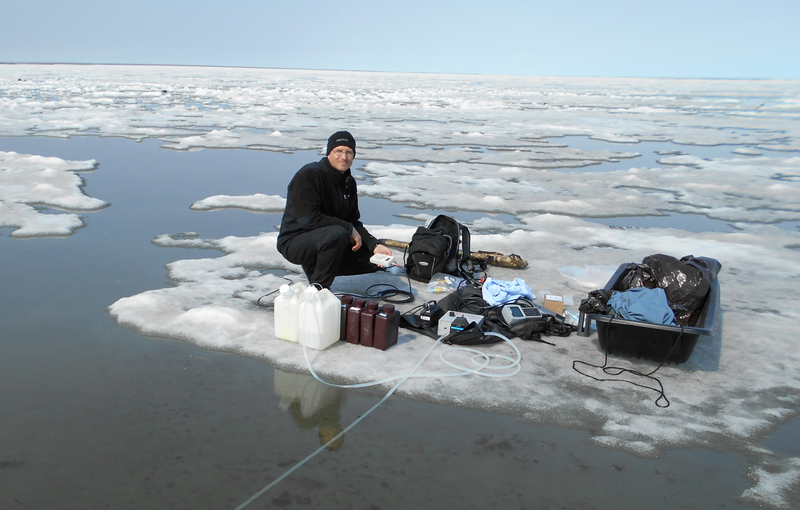 The LTER includes seasonal field work during ice covered, ice break-up, and open water periods and also includes sensor deployments for continuous measurements of key biogeochemical and hydrographic parameters. This LTER will advance our fundamental understanding of how temporal forcing influences trophic structure, stability, and resilience of food webs. It will also provide a much needed mechanism for tracking and understanding 1) how modes of climate variability such as the Pacific Decadal Oscillation and the Arctic Oscillation influence lagoon ecosystems along the Alaskan Beaufort Sea coast, and 2) how climate change impacts such as permafrost thaw, shifting precipitation regimes, and losses of sea ice alter lagoon ecosystems through effects on input and exchange dynamics, as well as carbon and nitrogen cycling within the lagoons.